The Sacrament of Baptism is a happy occasion for new Christians and their families, as we welcome them into the Christian Community—the Church. As a sacred commitment in response to God’s grace, Candidates for Baptism (their parents if they are young children) prepare for Baptism and active involvement in the life of the church. This webpage answers some FAQs and presents to you our understanding of Baptism and how we practice this. Exceptions can sometimes be made, but it will take more time and more face to face conversations to explore if the exception will be possible and how. Holy Baptism is full initiation by water and the Holy Spirit into Christ’s Body, the Church. In Baptism, we are forgiven of our sins, and given new and eternal life in Christ. We respond to these gifts from God by our commitment to live out this Christian life in active involvement in the Christian Community in worship, prayer, study, sharing the good news, and serving Christ in the world. These are the solemn vows we make in the Baptism service. Read more about the theology of Baptism below. What is required to be Baptized? Because of the nature of Baptism and the promises made at Baptism, active involvement in the church is assumed. For those who are not members of St. Peter & St. Paul, we can welcome you into our parish, or coordinate with your pastor if you are a member elsewhere. We schedule baptism at a baptism preparation session at least a month in advance (see below). Adults seeking Baptism prepare by participating in our Adult Confirmation class (contact the church 770-977-7473 for more information). There are no fees for Baptism. Can we have our child baptized here? We’re not interested in going to church anywhere; can we have our child baptized here? In the Baptism service, parents and Godparents promise to continue in the life of the church in various ways. If you are not going to be involved in any church, it would be inappropriate for you promise to be involved. Perhaps this is not the right time; you can visit with us for a while until those promises feel right to you. We don’t have a church; can we join and have our child Baptized there? Yes! We are delighted to help you get connected to our community. Contact us; we’ll get you connected and then start preparing for Baptism. 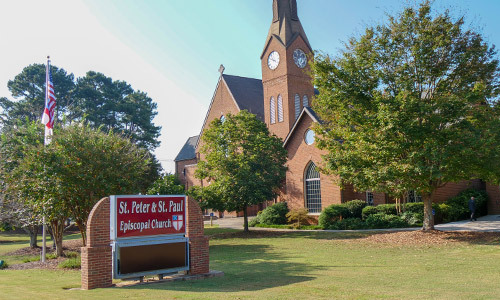 We aren’t members, but we have family ties to St. Peter & St. Paul and would like to hold our child’s Baptism here? Because the community in which you worship is the best place to find support for your child’s Christian development in the future, it is best to have the Baptism in the church you attend. In some cases, having the baptism here is an opportunity for the family to participate. In those cases, we can coordinate with your clergy to arrange preparation and follow-up support, and have the Baptism here. Since Baptism is, in part, entry into the life of the church, we celebrate this sacrament together, as a whole community. We would hold a “private Baptism” only in emergency situations, followed by the newly Baptized (or their parents) repeating their commitments in a public service when the emergency has passed. Parents would still complete the preparation in due course. What is involved in Baptism Preparation? A baptism preparation class must be completed at least 30 days prior to a scheduled baptism. Contact the church office for setting up a time. Parents are required and Godparents are urged to attend. We ask that before you attend, you all read these FAQs, the Theology of Baptism (below) and the Baptismal service itself (see the link below). During the session, we will discuss the meaning of Baptism for you and your child, and we will discuss the Baptism service itself. During this time, a nursery is available for little ones and Sunday School is available for Pre-K through High School (and adults). We also meet at 9:15 on the Sunday of the Baptism for a brief rehearsal. What exactly happens in the Baptism service? Read below about the theology and practice of Baptism, and read the order of service from the Book of Common Prayer. One theologian has noted that there are two parts to baptism: “bath” and teaching: gift and response. Normally, for adults, the teaching comes first—learning about God and coming to know God in Christ through the power of the Holy Spirit. The liturgy for Baptism begins with the candidate renouncing sin—that which separates us from God and from each other and leaves us broken—and turning to Jesus Christ, accepting him as Savior, trusting in his grace and love, and promising to obey him as Lord. With the promise of support from the community, the candidate then declares the Christian belief (the Apostle’s Creed), and makes specific promises to lead the Christian life. These promises include active involvement in the sacraments and Christian community, resisting evil and responding to sin by returning to the Lord, proclaiming the Good News by word and example, serving Christ in the world with love, and striving for justice and peace for all. Then the candidate is baptized (by pouring water on the head) in the name of the Father and of the Son and of the Holy Spirit; washing away sin, and sharing in new relationship with God in Christ that will last eternally. The mark of a cross is made with holy oil on the forehead, as a sign of being sealed by the Holy Spirit in Baptism. All Baptized Christians may receive the sacrament of Holy Communion, no matter their age or denomination. 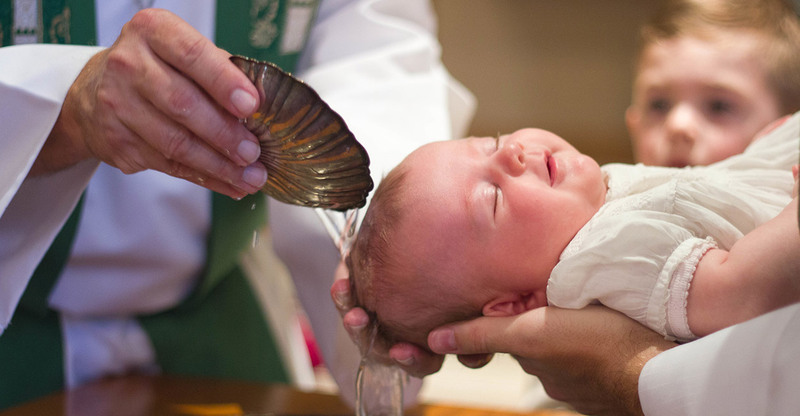 As has been done since the days of the early church, the Episcopal Church also baptizes infants. In this case, the order is reversed—first there is bath, then comes the teaching. We baptize infants, in part, because we believe that the forgiveness of God is a free gift from God—not something that can be earned. The teaching then comes after the “bath,” developing the child in his or her life in Christ through involvement and instruction in the church and in the family. So there is bath and teaching—gift of God and the faithful human response to that gift for both adults and infants. For infants, however, parents and Godparents promise to raise the child in the Christian faith, and make promises on behalf of the candidate. The Candidate can then affirm these promises at Confirmation as an adult. For more information on the Liturgy for Holy Baptism, see the Book of Common Prayer (click here and select “Holy Baptism”). Because of the importance of the community of faith in upholding and strengthening the newly baptized (and the family in the case of infants), and because of the promises to continue in the life of the church, Baptism is intended for those seeking active involvement in a church, (usually, this one, of course, though we can coordinate with a church local to you, if you are from out of town). To further the integrity of Baptism, preparation is part of baptism for adults or the family of young children.